VASEK and the Midway Alignment of the Bothnian Corridor project have commissioned Sito Oy to conduct a follow-up report on the utilisation of the railway section between the bus and railway station and the port in Vaasa as a special transport route for industry. A continuation of a preliminary account compiled in 2012, this new report started off from the wishes of Vaasa-based industrial enterprises. 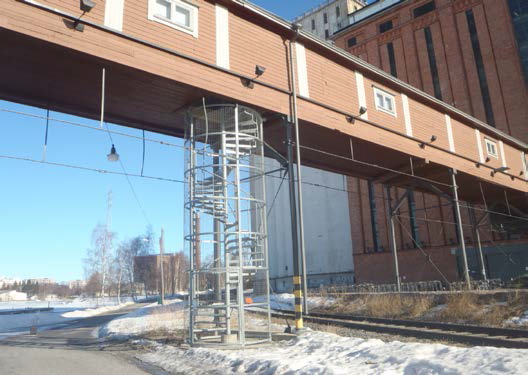 Its goal was to find out what kinds of action would be required to achieve high-quality, environmentally friendly oversized transport in a cost-effective way, utilising the rail section from Vaskiluoto to the bus and railway station for the region’s industry. The report also provides material to support the work of the City’s decision-makers, while aiming to maintain the rail connection to the port and to supplement the city’s internal oversized transport routes. The report was partly based on previous ones relating to the same subject. The report studied the viewpoints of the industry sectors that require oversized transport facilities, of forwarding agents and transit companies, the Finnish Transport Agency and the Finnish Transport Safety Agency Trafi, the City of Vaasa, the Port of Vaasa and the electricity company Vaasan Sähkö on oversized transport on this railway section and the necessity for it. In the light of interviews, various statistics and a report on the stream of goods passing through Vaasa port – whose operations are handled by Vaasa and Umeå’s joint port company Kvarken Ports – it is predicted that the port will become even more important for goods traffic than it is now. The growth of the port’s transport potential and the target of achieving cost-effective and environmentally friendly transport favour the construction of a route for oversized transport as a combination corridor along the current railway to the port. Making this section of the railway a combination corridor would mean that both trains and Self-Propelled Modular Trailers (SPMT) could run along it. An SPMT unit is a multi-axle platform vehicle with rubber wheels, designed especially for the transport of massive, heavy objects. “The implementation of the combination corridor is a large investment, but it would ensure competitive oversized transport facilities to the port for industries that need it and that are important for the region and the city, and allow oversized objects to be loaded either into goods wagons or ships. The port already has the necessary hoisting capacity for both these carriage options,” says Teijo Seppelin, the Manager of the Logistics Development Unit of the City of Vaasa. The current railway route leading to the port has a few sections that need to be improved before it can function as a combination corridor for oversized transport. Currently, the bearing capacity of the Vaskiluoto railway bridge allows no more than an axle load of 15 tonnes. On the electrified part of the railway, the contact wires set a height limit of 5.3 metres for the load. Vaasan Sähkö’s pipe bridge and the structures of the grain silo’s conveyor by Åbo Akademi University also restrict the height of the load, and at these points the line would have to be lowered a little. In addition, the railway section would have to be made a channel rail structure to allow SPMT equipment to run along it. The report also includes a preliminary cost estimate whose details will be specified more accurately when the planning for the required measures is begun. “This track for industrial use is an important part of the city’s logistics chain and its development work. The current transport routes are functional, but as carriage quantities increase, heavy special transport could be taken out of the city’s street grid and moved onto this industrial track. By utilising this industrial route, we will be better able to combine different transport methods on the road, railways and offshore and increase the utilisation rate of Vaasa’s port. This way, we will achieve more and more competitive transport chains,” says logistics expert Anna Måtts from VASEK.